Evening departure from London Heathrow on South African Airways overnight to Johannesburg. to the spectacular Erindi Game Reserve for two nights. Sunset game drive before enjoying dinner together. Early morning game drive in the reserve to observe the wildlife grazing and browsing. 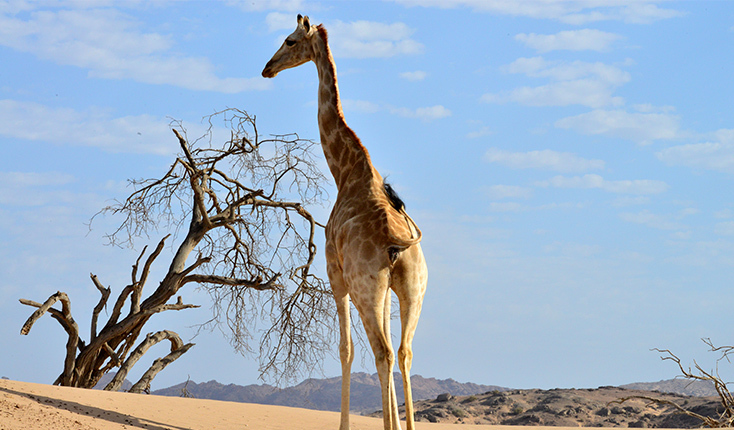 Chance to see giraffes, oryx, springbok and may be lions before returning for breakfast. The viewing terrace overlooking the large water hole at the lodge is spectacular. 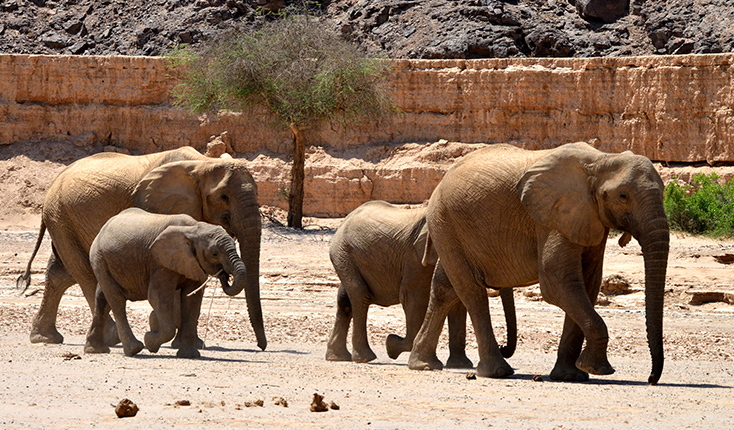 We enjoy an evening game drive perhaps to spot elephants, returning to the lodge for dinner. 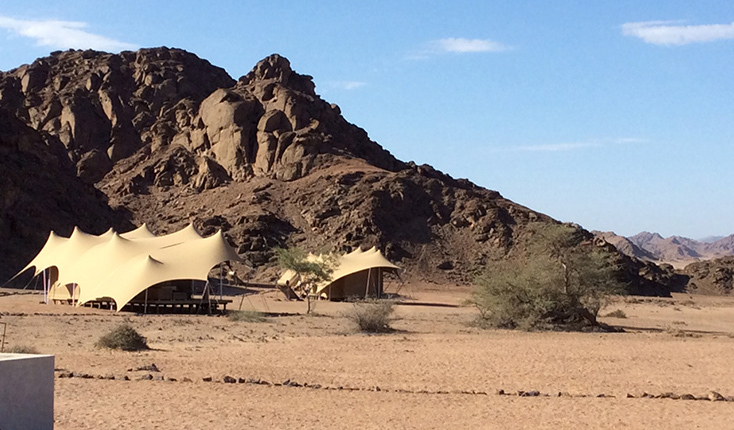 Morning departure to arrive at the Palmwag entrance of the remote Desert Rhino Camp set in a wide valley. Welwitschia mirabilis, Namibia’s elusive indigenous plant grown profusely along the track to the Camp. 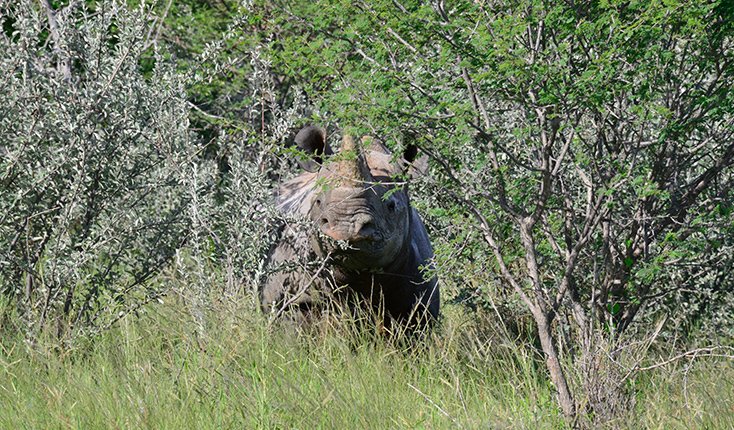 Black Rhinos are endangered and the Save The Rhino Trust is being actively supported at this Camp. We take a guided nature walk to discover the flora and fauna that live in the harsh environment. We enjoy a special bush dinner together. Full day’s outing in remote hills with trackers to find the wild desert-adapted rhino. The trackers recount their work during a picnic lunch in the shade of trees surrounding a water hole. On our return we may see the rare Hartmann’s mountain zebra. Return to the lodge to enjoy dinner around the fire pit with views across the wide valley to the nearby mountains. We gain an amazing insight into the ecology and conservation of the area. Leaving the Camp we take a short flight to the Hoanib Lodge in the remote Kaokveld region virtually inaccessible by vehicle. A land of dry riverbeds, mountains and vast plains, the lodge lies on the Hoanib River where trees grow surrounded by rugged mountain scenery. 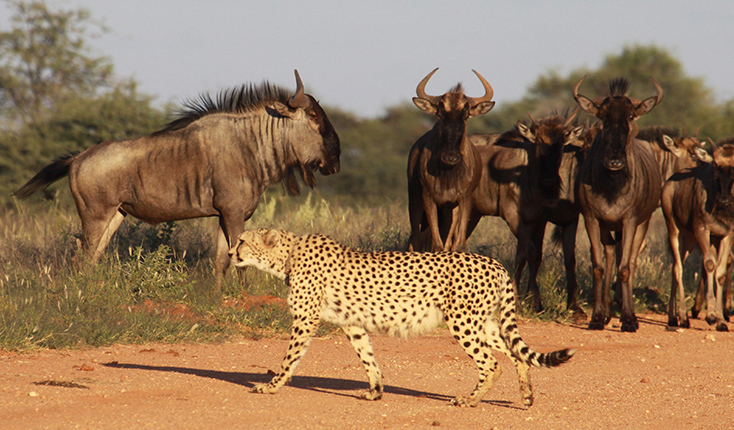 On game drives we discover the desert-adapted life of elephants, giraffe and antelope, followed by lion, leopard and cheetah. The Mopane and Camelthorn trees provide shelter and nourishment. A sundowner enjoyed just above the lodge is a special moment before dinner. A full day visiting the coast, taking the Hoanib river bed and floodplain, the dune fields and Klein Oasis in a 4×4, admiring the wilderness and wildlife. 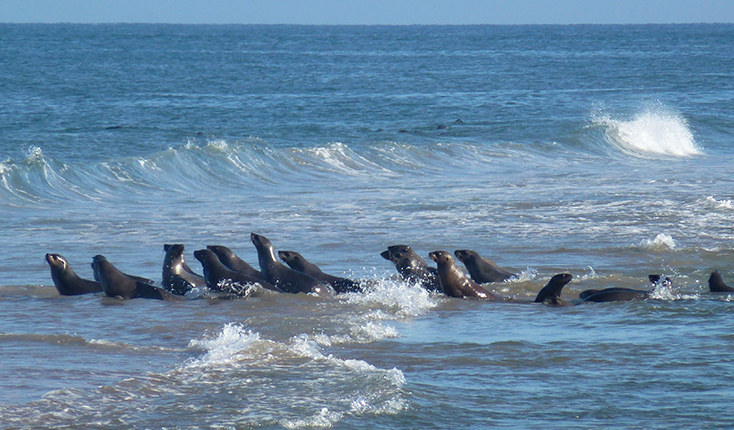 At the coast, the Cape fur seal colony is impressive and a few shipwrecks can be spotted. We enjoy a delicious picnic on the beach. If possible, a scenic flight back to the camp gives a magnificent perspective of the journey. Morning guided nature walk to discover smaller creatures and the fascinating plant life as well as the vestiges of the Strandlopers (beachcombers) who lived in the region hundreds of years ago. We learn about the vital work on wildlife protection, led by Dr Flip Stander and his team, especially supporting the desert lions. 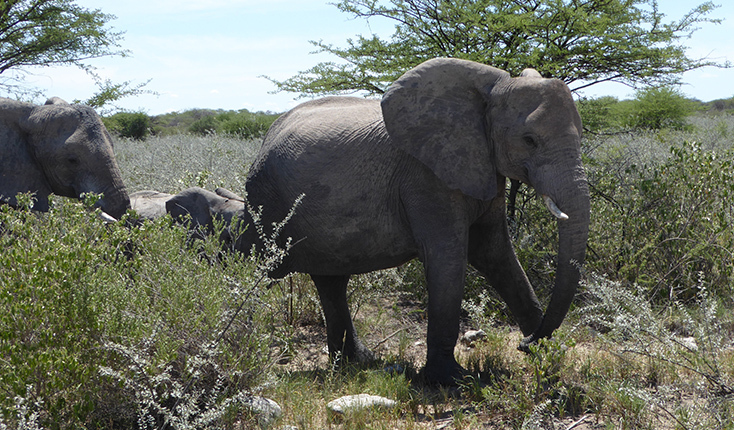 Afternoon game drive to explore more of the dry riverbed vegetation and wildlife. Morning short flight from Hoanib to join the minibus in Doro Nawas to head eastwards. 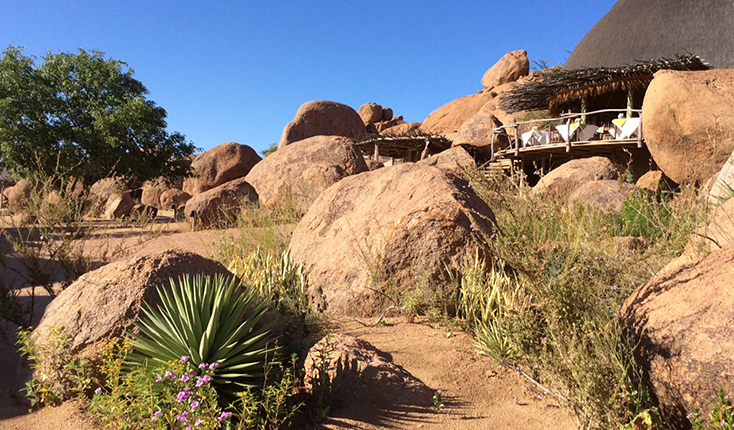 Arriving at our base, Mowani Mountain Camp surrounded by granite boulders, we take a gentle walk around the lodge area and enjoy a sundowner above the Camp with exceptional views of the landscapes. Dinner together. Early morning game drive to spot desert-adapted elephants and giraffes feeding on the trees of the dry bed of the Aba Huab river. 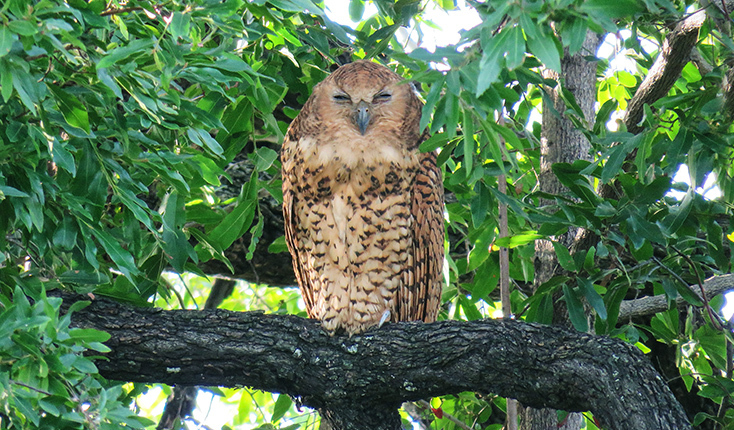 We should see extensive bird life and maybe lions, springbok, ostrich and blue wildebeest. We return at lunchtime. Afternoon guided walk in the Twyfelfontein Rock Art site to discover ancient rock engravings. We walk up into the boulder-strewn hills to watch the sun go down, returning to the lodge for dinner. Early morning game drive to admire the light and beauty of the mountains and discover elephants, perhaps kudu and oryx. Depart with luggage eastwards via Khorixas visiting a Petrified Forest, an accumulation of enormous fossilized tree trunks about 280 million years old, washed down a river after one of many Ice Ages ended on the Gondwana continent. We continue to Windhoek for a final night in the Olive Exclusive guest house with dinner together. The restaurant serves innovative dishes with local produce. Relaxed morning with a delicious breakfast and a guided visit of Windhoek before the transfer to Windhoek airport for the return flight via Johannesburg. Overnight flight to London Heathrow. Early morning arrival in London Heathrow Terminal 3.